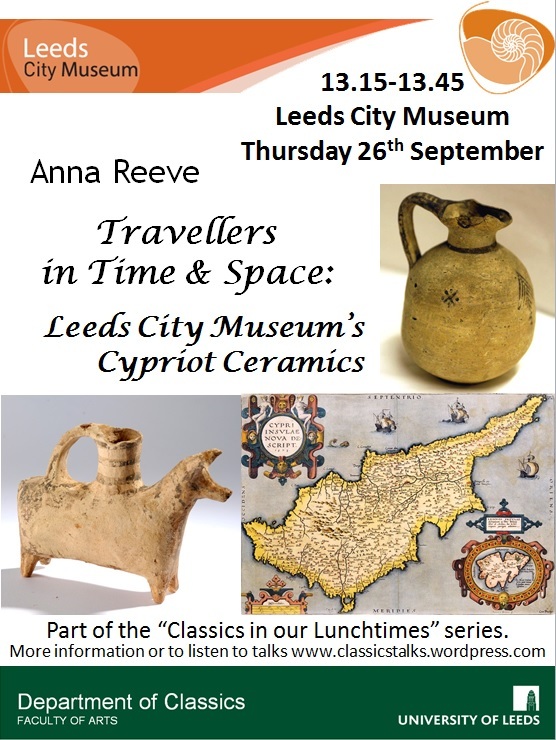 As part of her work in the archives of Leeds City Museum, Anna Reeve has been conducting research into the identities of the donors of Leeds City Museum’s Cypriot ceramics collection. In this talk she showed items from the Museum store as well as the Ancient Worlds Gallery and explored how these artefacts survived to the modern period and how the passion of individuals for them led to their coming to be in Leeds. “Travelers in Time and Space: Leeds City Museum’s Cypriot Ceramics” introduced the Leeds-linked collector Miss Stott (see photo, below), who was being brought to life for Light Night 2013 as part of “Dr OKell’s Carnival of Ancient Wonders” on Friday 4th October. View the Prezi (dynamic slide show) online. Bringing Research to Life: Anna Reeve (right) with Miss Stott (left: played by Eleanor OKell).